As you go through certain Ultra Wormholes while traveling through Ultra Space, you will sometimes land in an area where, as you land, you are told there is a strong presence coming from the area - this is a clue that a Legendary Pokemon is there. All Wormhole Legendary Pokemon can be found in there Shiny Forms, and after catching all the Legendary Pokemon of a specific location in the Ultra Space Wilds, you will be notified that the presence there is now gone. 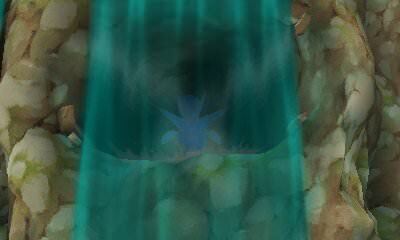 By traveling through a Blue Ultra Wormhole, you sometimes will be able to find and thus battle the Legendary Pokemon Latios. Latios is a Psychic / Dragon Type Pokemon, and it will be found at Level 60 knowing the moves of Luster Purge, Dragon Pulse, Psycho Shift, and Dragon Breath. No discussions open for Pokemon Ultra Sun at the moment.